I've gotten hassled by several folks now, several times, to post up a thread about the XV-JP that has been in the shop here. So to all of you who've been chomping at the bit, here's a look at what's been going on up here in the rain. We all agree that the XV-JP is one of the coolest rigs to come along in quite some time. The rugged Jeep platform, the crazy-cool safari look... it seems to have it all. However, as mentioned by seceral owners / users / onlookers, there's a few shortcomings when it comes to practical application. For now though, I'll skip the interior, but rather some of the other modifications. To begin with, there was the suspension. The XV-JP that I worked on came to me with a complete TeraFlex system installed in place of the factory suspension. The TeraFlex suspension system is well built and would definitely benefit any normal JK Jeep, but weighing in at almost 6700lbs without gear (with the bulk of the above stock weight being on the rear axle), the XV-JP is no normal Jeep. At highway speeds, the vehicle was unpredictable and challenging to drive- kind of a white knuckle ride. It didn't help that the vehicle was delivered with the rear sway bar inverted, but that's a different story. Righting the suspension was a challenge, but the folks ate AEV really pulled through for us. Through careful planning and a bit of luck, we came up with a system that would give a great ride both on and off road, mixing the bulk of AEV components with TeraFlex long-arms and a few slightly modified Chrysler components. The results are great! It took the plotter about 8 hours to cut the graphic, and as much as I hate to admit, I had to do both the grass on the passengers side, and the tree on the drivers side twice. This was by far the most complex vehicle graphic that I've ever made, and installation took forever. I've gotta say though, I'm really happy with the end result. This setup poses a few different issues. Firstly, have you ever tried to sleep in a tent this bright? Here in the Northwest, the bulk of the camping that we do is in the summer. Daylight can be 5:30am... see where I'm going here? The second issue has to do with dew, and even worse, rain. The tent that came from EarthRoamer is far from watertight- if it's raining outside, it's raining inside. Say you've had enough of getting all wet after 5 minutes of rain in your $100k+ rig- you fold up the top and head to a drier area, or even back home. Meanwhile, your saturated tent drenches everything else in your truck, and some of the components that don't have a waterproof coating start to rust... like your roll cage, which then leaves rust stains on your tent. Lastly, and perhaps most importantly, there's this rope, arm, and winch system to deploy the top/tent. While it is certainly 'techy' and cool, it also puts the bulk of the pressure on the drivers side of the camper box, and after a few months of use stress cracks had appeared all the way across the rear pivot point of the camper box. Not good- the winch was literally pulling apart the truck. The 'Northwest style' now sports a completely different system. instead of the top flipping all the way over like a giant lever, it now opens to an angle- kind of like an old Westfalia VW. It's cool, works great, and significantly reduces the load on the pivot point. As far as the mechanism, the ropes, pulleys, and winch have been replaced with a pair of industrial pneumatic rams that operate silently and effortlessly with the push of a button via the XV-JP's on-board air. Now that the top is in order mechanically, it was time to tackle the tent. Let me just say, that I have a lot of respect for tent makers. To make a custom tent is no easy feat. 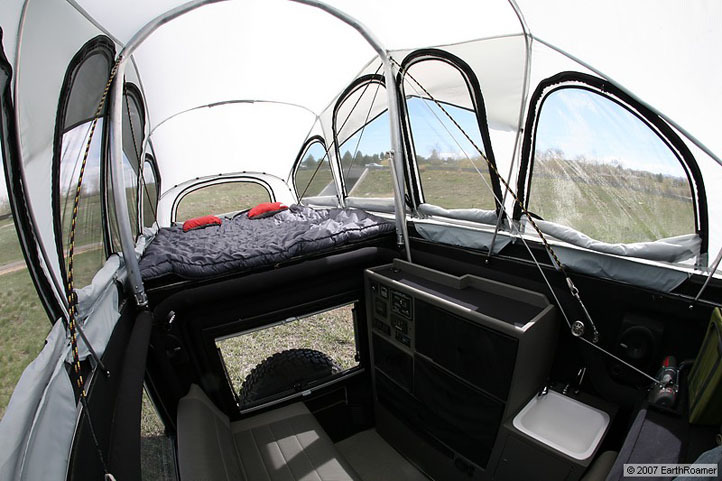 To prototype a custom tent made to be attached to a custom vehicle, withstand 75+mph winds (it gets that windy regularly here in the winter) and remain watertight is just as interesting as it sounds. We got creative. At the end of several days of fitting, re-fitting, resewing, then fitting again, the tent came out great... it's totally bomber. And that's where the vehicle build is at as of 10/27. There is plenty more to talk about, and I will... sometime in the future. The interior, the electronics, the trick controls for everything from winches, to fuel tanks, to the great A/V system- all of the many custom touches that make it perhaps the most unique XV-JP around. For now though, this is a long enough post. I like the awning over the front window of the tent. This is what I was hoping A/T would do with the flip pac for the Jeep. Slant roof to shed snow and heavy rain. We all dont live in the desert and need a real ALL WEATHER camp top. I think your redesign would work for what I would want in a FOUR SEASON Jeep camp top/flip pac. When the A/T flip pac comes out for the Jeep you could build a side business doing what you have done here to the E.A. to the flip pac! Just thinking aloud, would it have been possible to do the tent sides in some sort of hard material that folds down into itself...? Even better protection in the rain i'd have thought.... almost like Sonke's toyota conversion. James, thanks for sharing this project. I'm sure the folks at Earthroamer will be reading this closely. Regarding the new tent top, the result doesn't look long enough for adults to sleep in. Is this correct? Very interesting information about the build and rebuild of this vehicle. Excited to see what is done with the interior. Fantastic ! ! ! I have been waiting for this posting. It looks great and "XV-JP Northwest Edition" is a great name, although I was kinda hoping for "XV-JP 'MH' Edition"
By the way, this lifting roof design looks like something that could really take off here - already thinking about its application to other set-ups. Also, really like the idea of using pneumatic rams, rather than hydraulics (one leaky seal and oil everywhere :smilies27 ). I previously had a google around, but could not find ones similar. Would you mind to share where such ones could be found, please ? I cant wait to see the final product. man, I'd like to see how the original top was opened with a motor. do you have any pictures of how it all went together? btw, that looks sweet, where do the people sleep now? Is anyone else surprised and a bit bothered that a $100,000+ vehicle has design flaws that compromises the structure? I would think with that price size of a price tag, the engineering would be a bit better. If you look closely at this photograph you will see in the bottom right corner the winch that is being used to close the top.